Meet on the front porch of the Franklin Environmental Center (FEC) for the very popular Campus Tree Tour led by passionate Middlebury horticulturalist and tree expert Tim Parsons. This year, FEC is focusing on the theme Urban Innovations, Sustainable Solutions, which will include exploring connections between urban and rural. As part of the tour, Tim will explain why he manages our rural Vermont campus as an urban forest. Stick around after the tour for a tree planting, complete with hot cider and fresh local donuts. Bring your willingness to learn about and to get a little dirty. Anyway, where have I been and what am I thinking? Anyone blogging in an academic setting probably knows the difficulty. I liken it to a lead weight between my shoulders. I know I should be posting more, but being surrounded in an environment filled with people much smarter than I means a blog post needs to be weighty, relevant, and not a stream of consciousness this is turning into. In short, a blog post is something that takes considerable inertia to start. But start I shall. And, naturally, I’m starting with the landscape. Come on my tree walk, I’m picturing it as an “Envisioning Middlebury-Landscape Edition”, to piggyback off the excellent work the community conversations around this topic that are happening. Un-facilitated though, unless you count the trees. (I’ll show you how they are talking back to us.) Landscape is not static, and as we discuss the future of Middlebury let’s not forget the outdoor physical environment as well. This entry was posted in Midd Blogosphere and tagged Arbor Day, landscape, Tree Campus, tree planting, Trees on October 6, 2016 by Tim Parsons. I’m hosting a tree tour and tree planting for our fall Arbor Day celebration this Wednesday at 4:30. It’s part of the 50 Years of Environmental Education & Leadership at Middlebury celebration (view the whole schedule here). We’ll be leaving from the front porch of Franklin Environmental Center (Hillcrest), wandering around wherever my feet and your questions take me, and ending up back at Hillcrest about 5:30 to plant 3 oak trees on the corner. The oaks are coming from Miller Hill Farm in Sudbury, and are a mix of Red and Bur Oak. We’re replacing two blue spruce that died in that location, and these will be hardy long lived street trees. Another Sugar maple is dying nearby (not a great street tree, by the way), so the oaks are particularly fortuitous here. And of course, doughnuts and hot cider. Come be as happy as these volunteers last year! 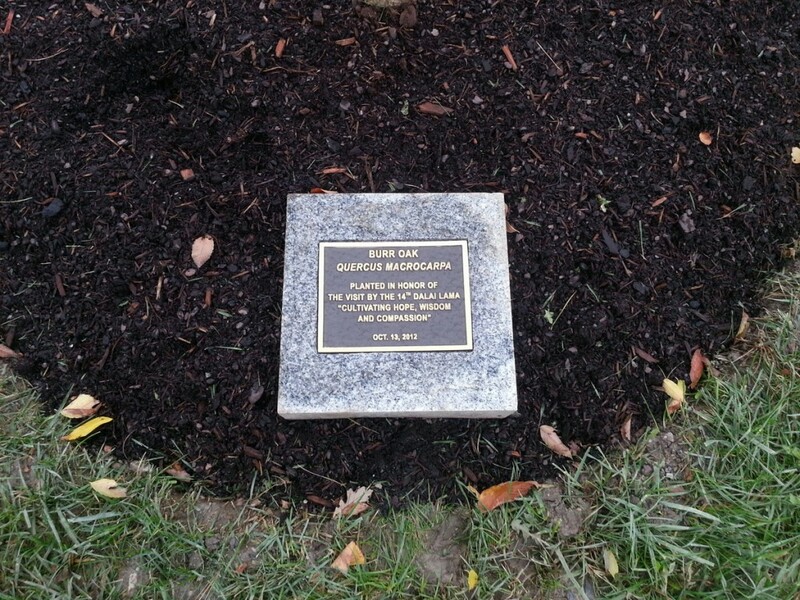 This entry was posted in Midd Blogosphere and tagged Arbor Day, Tree Campus, tree planting, Trees on October 5, 2015 by Tim Parsons. An extremely late spring-not warming up until mid May-left our landscape department short on time. We decided to postpone Arbor Day for a fall celebration, which we are holding next week. Friday, October 10th, starting at 3:00. 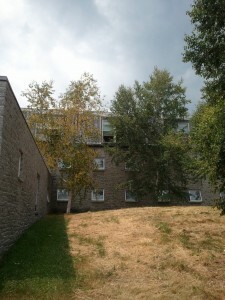 The west side of Battell-the corner of Battell Beach. 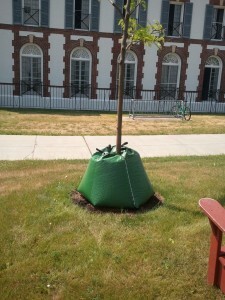 After looking at the oldest trees on campus, at 4:30 we’ll plant what will be the youngest trees on campus. This is an area that saw a lot of tree vandalism (since cured! no damage this year). We’ll plant a half dozen or so trees on this corner of the beach, forming a little grove of color. We’ll bring the food, and pre-dig the holes (oh, hydraulics and backhoe, my mistresses in crime), so all you’ll need to bring is a willingness to get your hands and knees a little dirty. Rumor has it there will be ice cream, cider donuts, and cider. Come for the tree tour, or come for the planting, or join us partway after your classes. I’ve never done a tree tour during foliage season, so if you’ve gone on one before this one will have new stories. Oh, and someone bring a frisbee. My 14 year old daughter just joined the high school frisbee team, and needs some practice. 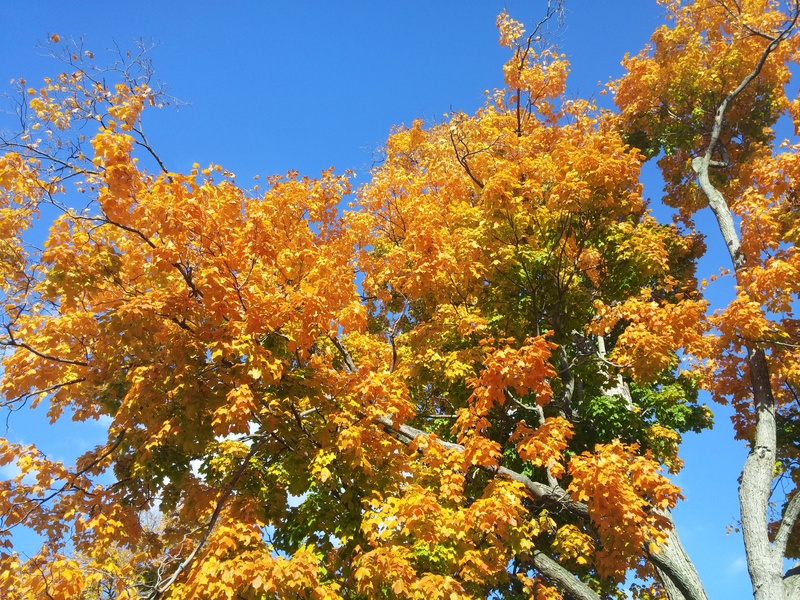 This entry was posted in Midd Blogosphere and tagged Arbor Day, Campus community, landscape, Tree Campus, tree planting, Trees on October 3, 2014 by Tim Parsons. love a tree? share the love. 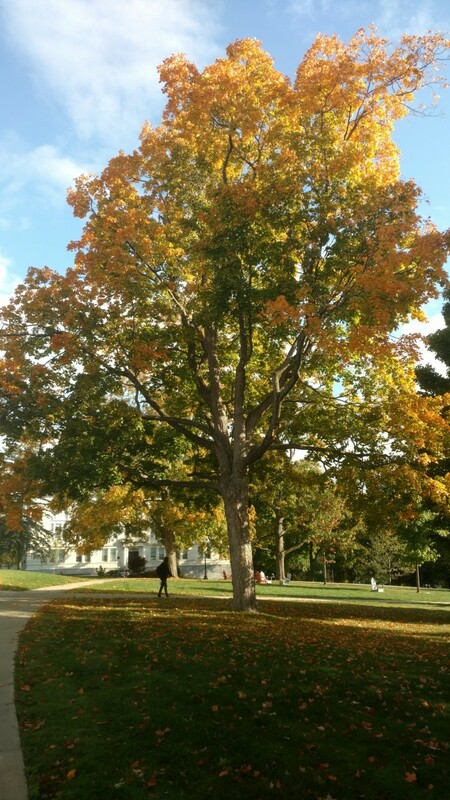 send us photos, poems, and other art about your favorite campus tree. Submit a photo, or post on twitter with #middarborday. submit by may 10 to have your tree featured in the arbor day tree-k race! Either go twitter (@middland) or send to tparsons (at) middlebury.edu to submit. Prizes, fame, fortune, and good tree karma await. And the winning trees will become the basis of the second annual Tree-K race around campus (run 5-K,, and learn the names of 5 of the trees along the route to win) A kid’s race will be held as well. Winners receive gift certificates to the Grille. Food, music, and ice cream-We’ll be on the Atwater plaza, with a cookout by Grille Catering using local foods, ice cream, and listen to music by Will Cuneo and Rita Pfeiffer. Enjoy the sunshine for an hour or two before heading back inside to study for finals. A huge thank you to the Environmental Council for funding us! So spread the word, let your neighbors know, and come celebrate our campus forest. This entry was posted in Midd Blogosphere and tagged Arbor Day, Campus community, landscape, Tree Campus, tree planting, Trees on May 2, 2013 by Tim Parsons. Nature can teach us many things. Life, death, love. And Hope, Wisdom, and Compassion. How appropriate the 14th Dalai Lama uses ‘cultivating’, the act of promoting growth, to describe his wish for the dissemination of his main tenants for the human race to strive for. Think of a tree. When you think of a tree, you tend to think of a distinctly defined object. But when you look at it more closely, you will see that it has no independent existence. When you contemplate it, you will find that it dissolves into an extremely subtle net of relationships that stretch across the universe. The rain that falls on its leaves, the wind that sways it, the soil that nourishes and sustains it all the seasons form part of the tree. As you think about the tree more and more you will discover that everything in the universe helps make the tree what it is; that it cannot be isolated from anything else and at every moment its nature is subtly changing. 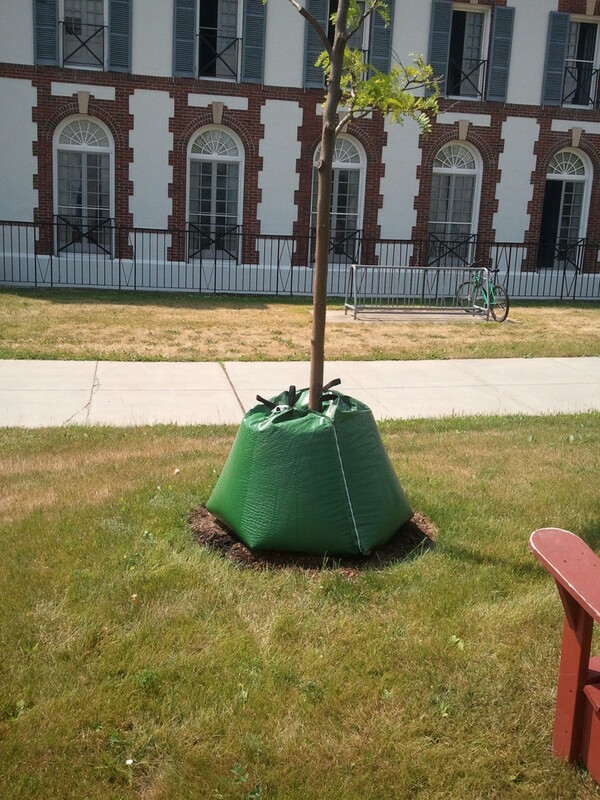 A Bur Oak is planted next to the Garden of the Seasons just south of the main library, waiting to be blessed by His Holiness the Dalai Lama. Think about this tree, as it grows tall and wide, its roots spreading far across the quad joining its companions, and be reminded that like a tree, we all depend upon each other as well: we all share a subtle net of relationships. Let the small oak show our hope, our faith in growth and long life, as our grandchildren will see the large tree. And let it teach us wisdom, like the timeless ‘wise old oak’ of our childhood stories, and learn from it compassion, as no tree stands alone. This entry was posted in Midd Blogosphere and tagged Campus community, ecology, landscape, tree planting, Trees on October 12, 2012 by Tim Parsons. Pick up any plant biology book, and they consistently list the three macro nutrients all plants need as N, P, and K, the chemical symbols for Nitrogen, Potassium, and Phosphorus. But really, what we share with plants is a need for ‘macro’ macro nutrients, something so profoundly necessary that the books don’t even feel the need to list them, and they form the backbone of all life. We’re talking about C, H, and O, or Carbon, Hydrogen, and Oxygen. The carbon and the oxygen are easy, the plants are getting that in the air we breathe. It’s the Hydrogen that’s been stressing me out lately. Plants obtain it solely from water, through photosynthesis. I always remember my snide remarks in the retail garden center world, when a customer would ask me what kind of fertilizer to buy with their new purchases. For the most part, I’d tell them the single greatest thing they could do would be to water. How much? It’s a good question with no real definitive answer. I remember from who knows where that gardens in the northeast need about 1/2″ of rain a week in the growing season, and an article on strawberry production I found says about the same (actually .63″). Trees need quite a bit more, though, as they have much more extensive roots throughout the soil horizon. Plan on 2″ of rain a week. I found a handy online calculator to do the math, but here’s a quick answer. A newly planted tree with about a 2″ trunk, should have a 5′ x 5′ zone watered around it, so that’s about 30 gallons, pretending to be a 2″ rain. Sounds a little high, but the wild and woolly world of plants is never easy. Last year we were averaging 4″ of rain a month, and we didn’t have to do any supplemental watering. On cloudy days plants don’t transpire, or lose water, at as great a clip, so maybe last year it was fine. Or not. We’re running around like chickens with our heads cut off right now, watering every tree we’ve planted for the last 3 years. (that’s a lot) All of our recently planted trees are showing drought stress, and I’m wondering if I hadn’t watered enough in the last 2 wet years to well establish the trees. When watering, it is best to water a lot all at once, so that the roots have ample moisture and can grow long and deep. Too little water, and the tree keeps its roots near the surface, where the water is, and this makes it less drought resistant in the long run. We water all trees with 40-50 gallons of water about every 2 weeks. We use two gator bags zipped together, and they drain over the course of about a day. We hand water any tree we missed, and then gator bag it. In this heat and drought, I’d like to water weekly, but I’ve been checking the ground around the trees, and I think we’re keeping up. Another good trick I learned once when hand watering is to watch the ground as it absorbs water from the hose. I think this is the one of the Eliot Coleman gardening books, but I loaned my copy out and now it’s gone. Once the ground starts to get saturated, the top gets glossy. Take the hose off that spot, and the glossiness will disappear. If you can count to 3 before the glossiness is gone, the ground is moist enough. identifying drought stress in plants can be tricky, especially in herbaceous plants like annuals and perennials. Woody plants are easier. The inner leaves of the tree turn yellow and fall off. I find this remarkable. It isn’t like trees have brains, but here they are smart enough to drop the inner, less efficient leaves, to conserve its precious water for the maximally producing outer leaves. By the time your plants are showing symptoms of drought, obviously much damage is done. Plants are pretty hardy, so even with serious problems the tree will probably be fine. This entry was posted in Midd Blogosphere and tagged drought, ecology, landscape, tree planting, Trees, watering, Weather on July 24, 2012 by Tim Parsons. 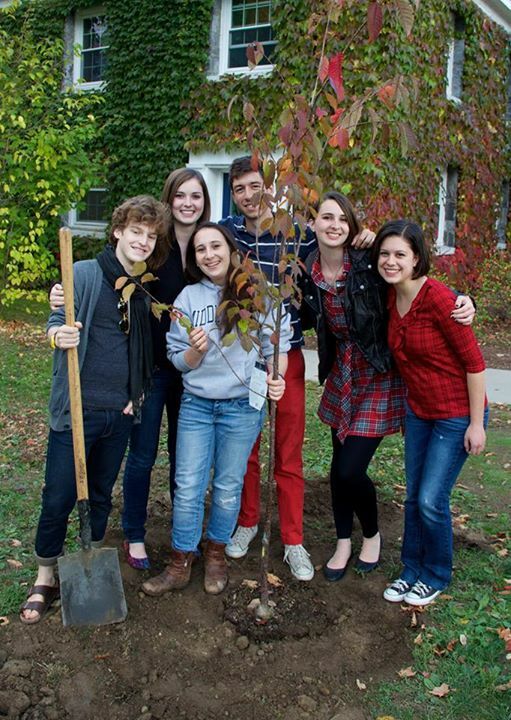 Middlebury College once again has been certified as a Tree Campus by the Arbor Day Foundation, and the landscape department is celebrating by planting more trees (naturally). 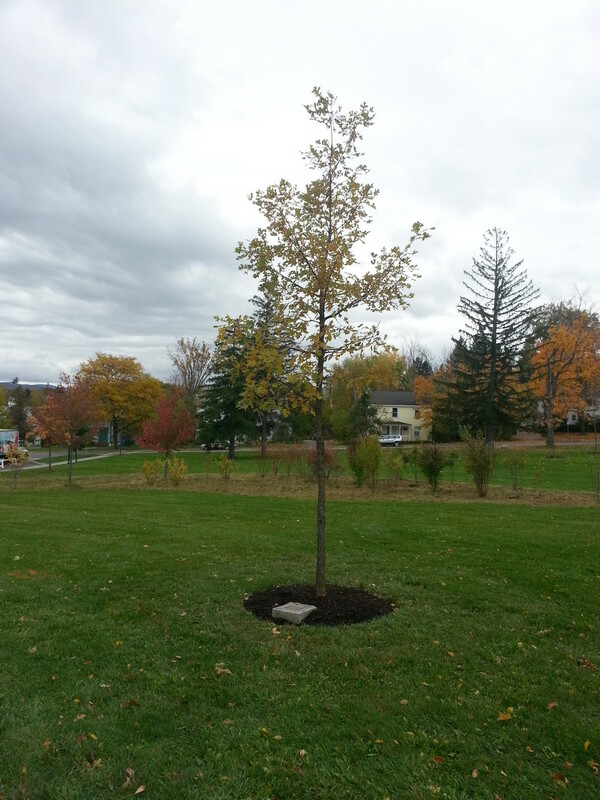 Come join us Friday afternoon from about 1-4 just north of Battell as we plant five large shade trees. The holes will be pre-dug, so it won’t be too much work. (Sorry, can’t let you run the backhoe; I would if I could). Students, faculty, staff, children, all are welcome. Come make a permanent mark on our campus, and get some dirt on your knees. This entry was posted in Midd Blogosphere and tagged Arbor Day, For Faculty, For Staff, landscape, Tree Campus, tree planting on May 18, 2012 by Tim Parsons.